This year represents the 40th year since Kyosho first started business. A history of Kyosho RC cars wouldn't be anywhere near complete without particular reference to off-road vehicles. This installment looks at Kyosho's role in RC buggy racing and the machines that defined a hobby along the way. When did buggy racing first start in Japan? The inaugural JMRCA sponsored Japan 1/8 Class Buggy Championships was officially recorded in 1973. However, not many people still remember the days of "grass-track" races where the pioneers of buggy racing first started. Various opinion indicates that before the first Japan National Championship, two or three proper race events had already been held. According to Mr. Naohiko Otsuki, the creator of the Kyosho Dash 1 - the first "Made in Japan" RC car (refer 1st installment), before RC buggies were seen in Japan, he had seen pictures of Italian buggies in foreign magazines. But the drive system from the engine consisted of a primitive round belt and these machines did not appear well constructed. At that time, off-road buggy racing was very popular even in the realm of full-sized cars. In 1970, the year of the World Expo in Osaka, a limited release of 100 Daihatsu Fellow 360cc buggies went on sale. This added a new stimulus, and the success of the Kyosho Dash 1 triggered the development of RC buggies in Japan. After the Dash 1, Mr. Otsuki created the first Kyosho RC buggy in 1972: the Dash 3 DUNE BUGGY. However, shortly before the Dash 3 was released, the Ishimasa Rat Buggy was on the market. Mr. Takahashi (President of Ishimasa), created a unique brand from his combined stonemasonry business in Himonya Meguro (inner Tokyo). This is thought to be the first "Japanese" RC buggy, and featured an ambitious assortment of components: front wheel strut suspension; split rear axle and a layout faithful to the full-sized VW buggy. At a time with nothing to use as a guide, Mr. Otsuki is full of praise for Ishimasa's (his one-time rival) originality. Soon after the Ishimasa, the Kyosho DUNE BUGGY was released. However, as it was a modified version of the Dash 3 on-road racer, it couldn't really be called a true buggy. Without front/rear suspension, a buggy body was simply mounted on a rigid chassis for a relatively unsophisticated result. 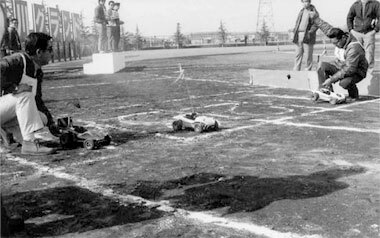 Even while RC buggies were being born, buggy racing activity was developing. The simple designs provided a wide range of opportunities for dedicated racers to modify the machines which added another aspect to the growing fascination with buggies. 1972, Tamagawa Ground, Kawasaki, Kanagawa. This is where the first buggy race was held in Japan. The first race was held in 1972 at the Tamagawa Ground in Kawasaki. People looking for chance to race their machines got together and did just that: this was the very beginning of buggy racing. The race was basically a two-make race with the Ishimasa RAT against the Kyosho DUNE. The sophisticated RAT looked to get an early advantage versus the simply constructed DUNE, however the DUNE's durability ensured its recovery in the later half of the race. At the time, racers were able to modify many components in their machines, so a 10 car race, would inevitably feature 10 different cars. At this time, Mr. Otsuki says he gathered an amazing depth of knowledge from these pioneers of buggy racing, when it was just beginning. This was the era of experimentation. Sometime after the Tamagawa race, another buggy race scene started in Kakio, Yokohama. Club CPRT sponsored the event held in an open lot at the back of Touin Gukuen. Many people would still remember this race series which ran over a long period and was held up to once every two months. Then in 1973 at the Sagamiko Picnic Land, the first 1/8 class Buggy Championship was held. This saw the duel between the RAT and the DUNE expanded into a three-way challenge with the entrance of a new player: the Seki Mokei CAT. The CAT BUGGY, created by the president of Seki Mokei (of Setagaya, Tokyo), was the most advanced design of the day and pioneer of double-wishbone suspension. The CAT was very fast and very popular, but suffered durability problems. With so many hand-made components, production costs were high and the CAT was sometimes referred to as the "Bolt Monster", aspects which would be considered more valuable now than they were back then. The Sagamiko Picnic Land saw epic battles between the DUNE and the CAT BUGGY. Lateral weakness in its double-wishbone and bouncing from its low rings resulted in frequent rollovers. Mr. Otsuki noted this and shortly after, the Kyosho buggy was using a trailing link. The Kyosho DUNE BUGGY showed its first evolutionary leap in 1973~4. The Racing Buggy RX100 had improved durability and lighter weight, which was improved even further with the Dx Chassis Kit to set a new performance benchmark. Spike tires mounted on the rear wheels made a huge impact and when Mr. Otsuki thinks back to the risky decision to invest in molds to produce spike tires, it was definitely the right choice. The inspiration for spike tires came from one of the early fanatical buggy racers. The outside of the thread pattern on the rear tires on this racer's Ishimasa RAT BUGGY were cut off and replaced with small pieces of rubber fixed with super-glue. At this point, Mr. Otsuki realized that spike tires would improve lateral resistance. The Kyosho Dx chassis which included spike tires, had much improved straight running performance and also handled uneven surfaces better. Due to its light weight, it also produced more speed. After the Dx Chassis Kit, Kyosho accelerated its development for improving durability and speed which led to an extended period of unrivaled performance. The next thing, both the RAT BUGGY and the CAT BUGGY had disappeared. After this the market was flooded with new RC cars when manufacturers rushed into the fast growing hobby. Kyosho won the right to continue through these turbulent days of the "RC car wars" with its circuit buggy. Kyosho developed the double trailing-arm circuit buggy and became the leading brand in the engine powered buggy category. Kyosho's development continued apace with the 4WD Land Jump 4D through to the Inferno 4WD, winning the World Championships, for the last six times running. This buggy was also based on Kyosho's DUNE BUGGY, but with many modifications. Presentations on the modifications made by fanatical racers were also an aspect of the times. Mr. Masayuki Suzuki with his winning DASH III DUNE BUGGY, with a SuperTiger engine. The 3 buggies on the left are the Kyosho DASH III DUNE BUGGY. The Ishimasa RAT BUGGY is the first on the right. The DUNE vs RAT race. The same Tamagawa race. This jump was built as the race highlight. 1974, Arakawa River Bank Race. The big showdown between the Kyosho Dx Chassis Kit and the Seki Mokei CAT BUGGY. Presentation ceremony at same race. Mr. Hisashi Suzuki (JMRCA Chairman and Kyosho founder) presents winnerﾕs trophy to Mr. Hiroshi Shudo. Mr. Suzuki fostered the RC car racing world in Japan. 1972, DASH II DUNE BUGGY RX. 1/8 scale with .19 engine. Kyosho's memorable first off-road model. The first "real" buggy made in Japan. 1974, DASH VII DUNE BUGGY. The DUNE BUGGY model with an engine starter. The hand-pull starter, made a huge impact. 1974 RACING BUGGY RX100. Designed specifically for racing competition. Included carbon gears, spring starter with roller clutch, clutch bell with machined pinion gears etc. 1974, DELUXE CHASSIS KIT. Best model in its class for buggy and dirt racing. Independent suspended split rear wheels, and knobby tread on rear wheels showed its full power. 1976, CIRCUIT BUGGY. A 1/8 pipe bodied pure racing machine. Included oil-filled shocks. Equipped with the world's first double trailing-arm. 1976, PEANUTS 09. 1/10 scale entry level buggy. Regarded as a true "fun-car" this was the first car to have reverse function with a 2-channel radio. 1980, LAND JUMP 4D. Kyosho's first tuned drive 4WD. Equipped with the worlds first front one-way bearing. All four tires were of the same diameter. 1984, CIRCUIT BUGGY EXTRA. The first model with an optional diff gear. At the same time, an optional diff gear was also produced for the LAND JUMP INTEGRA. 1986, INTEGRA 4WD. Equipped with double-wishbone suspension. This became the last model to use a ladder frame. Loaded with a 21-class engine. 1987, BURNS 4WD. Developed to conquest the buggy world. Used a flat-pan chassis and shaft driven 3-diff. drive train. The direct predecessor of today' models. 1991, INFERNO 4WD. Designed with strengthened suspension and lower center of gravity. Improved geometry and alignment, and achieved victory in the 1992 World Championships. Has repeated this feat consecutively at the last six World Championships. 1978 ELECK PEANUTS. Kyosho's first 1/10 electric powered buggy still used the PEANUTS 09 body. 2WD rear-wheel drive. One-touch gear changes allowed easy use of all three gear ratios. 1982, SCORPION. 1/10 size, rear 2WD and included oil-filled shocks. Optional diff. gear also appeared. The famous name that the foundations for 2WD electric racing buggies was built on. Used a cement resistor-type (3-step) speed controller. 1983, TOMAHAWK. 1/10 size, rear 2WD. New generation machine that improved on the Scorpion's race competitiveness. Controller changed to an electronic transistor-type. 1984, PROGRESS 4WDS. The first 4WD 1/10 electric powered buggy. The first and last precision 4WS model. From this point onwards, electric 4WD buggies became mainstream. 1985, OPTIMA. Appeared in the first 1/10 Electric Buggy World Championships held in America in the same year. Took its place amongst the world's best with its distinguished debut performance. The first Electric Buggy Japan Championships were held the following year in 1986. 1987, ULTIMA. 2WD. Achieved victory at the Electric Buggy World Championships held in England in the same year. Used the latest technology ultra-long stroke front suspension, large capacity oil-filled shocks, and aluminum monocoque chassis etc. 1989, LAZER ZX. Combined mid-ship mounted motor with two-belt drive train. Front wheels equipped with center one-way clutch. Could be referred to as the greatest electric 4WD buggy in history. 2003, EP ULTIMA RC TYPE-R Evolution. The current leader of the electric powered (EP) 2WD off-road buggy world. Mr. Kiyonori Mase (37) from Kyosho's Product Development Group. Joined Kyosho in 1986 and started work on developing electric powered cars. Finished 3rd at the 1989 EP Buggy Japan Championships.